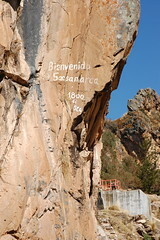 After immersing myself in the tragic past of Huancavelica by visiting the Santa Barbara mine, it was time for me to get to know modern Huancavelica. 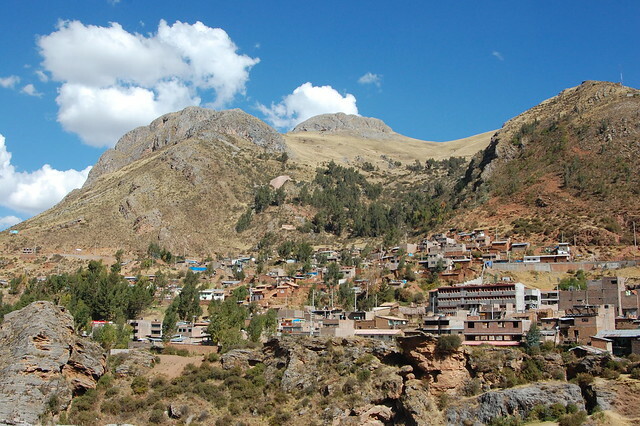 Huancavelica is considered one of the poorest regions of Peru, probably due to its reliance on subsistence farming and the continuing depletion of its mercury deposits. 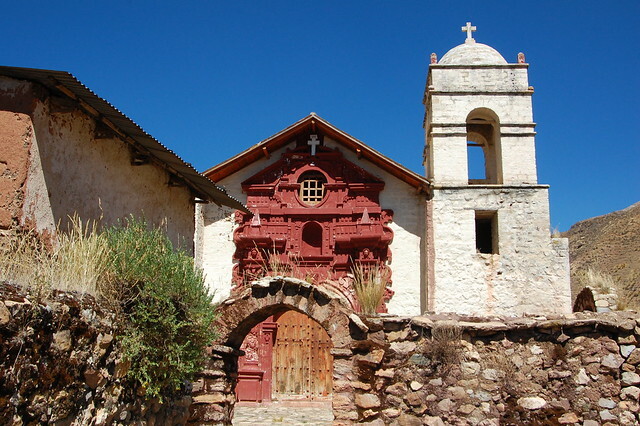 However, Huancavelica has a rich connection to its cultural heritage, demonstrated by the art found throughout the city that celebrates its traditional dances and lively religious festivals. 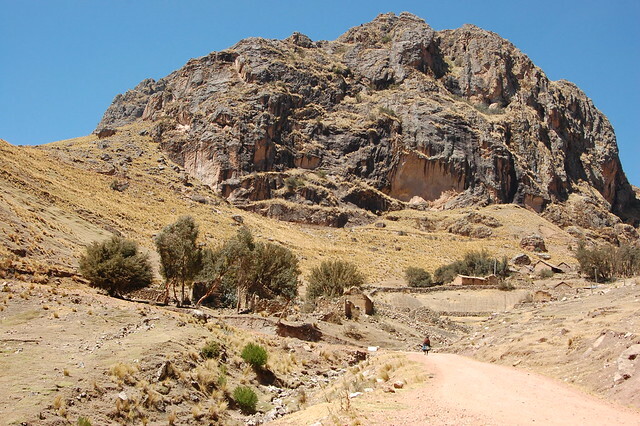 Further, Huancavelica’s artisans are some of the most talented in Peru, which has led to the development of artisan collectives to produce and sell its colorful knitted and woven goods both nationally and internationally. I decided to learn more about the city by wandering the streets, visiting the artisan markets, and checking out the attractions favored by locals. 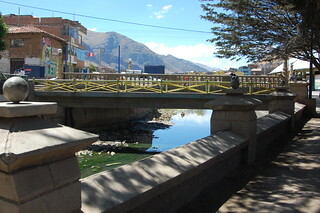 The city of Huancavelica is divided by the Río Mantaro (Mantaro River) that runs through the center of town. The attractive Malecón Santa Rosa follows the path of the river and brings you to the main bridge that connects the two sides of the city. Crossing the bridge leads you to a steep staircase which climbs directly up to the Piscina de San Cristóbal, thermal baths popular with locals. This is no ordinary staircase; the escalonada has been thoroughly decorated with stone mosaics, statues, and murals that celebrate the local dances performed at the annual festivals. These performances reenact the complex cultural heritage of contact between the Spanish colonizers and the indigenous population. 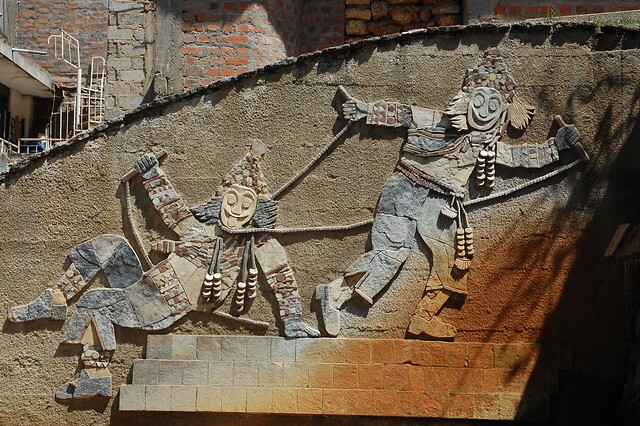 In a city whose history consists of centuries of forced work in the deadly mine, these dances are particularly powerful. In the end, I decided not to bathe in the thermal pools, but rather wandered around a bit, taking in the people doing their laundry in the fountains outside. Nearby, there was a building that technically houses an artisan market, part of the Complejo Ecoturístico de San Cristóbal, but it looked fairly empty and abandoned when I wandered around inside, all of the stands closed, probably only staffed during seasons of high tourism. After visiting San Cristóbal, I headed back to the center of town to check out the Museo Regional Daniel Hernández Morillo located near the Plaza de Armas. 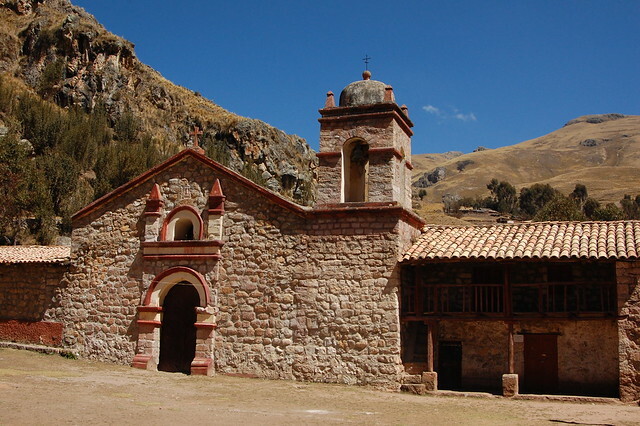 While this museum is very small, it gives you a sense of the ancestral heritage of Huancavelica. 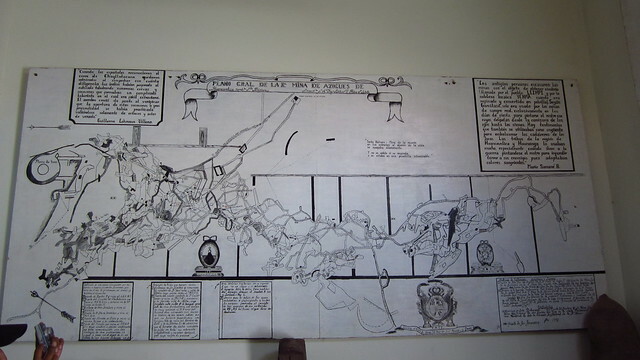 I was more interested in the older maps on the wall near the entrance, which showed the layout of the mountain town, along with some quotations commemorating the tragedies suffered by the people of Huancavelica in the Mina de la Muerte (Mine of Death). There is also a small bookstore, where I purchased a book of traditional folk tales from the region. Next, I stopped by Qampaq Arte’s boutique, located at Jr. Arica 230. 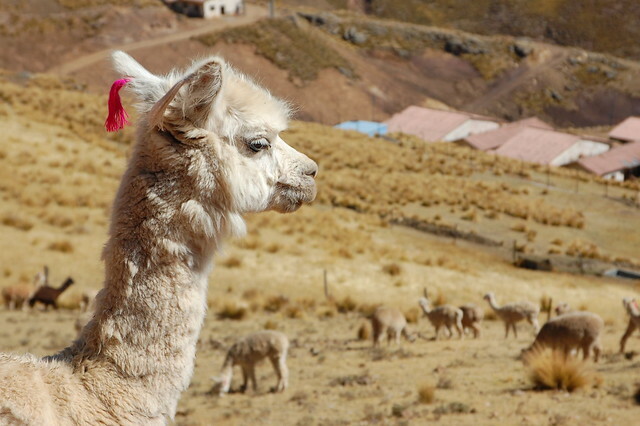 This small store has some of the highest quality alpaca goods you can find in Huancavelica, which are displayed like the pieces of art they actually are. Qampaq Arte is the storefront for the fair trade handmade goods produced by their artisan collective. 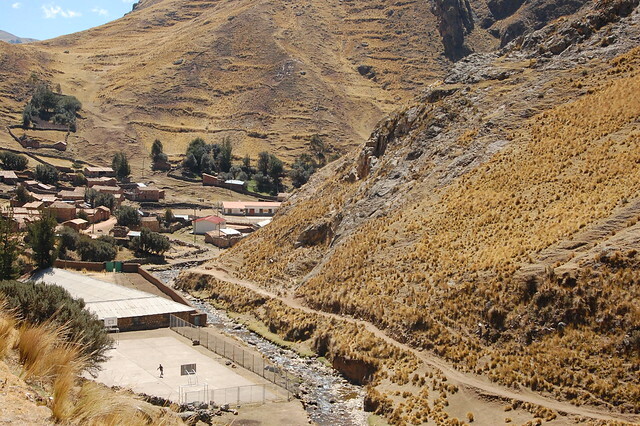 Most of the artisans live in the communities around Huancavelica, particularly Yauli. 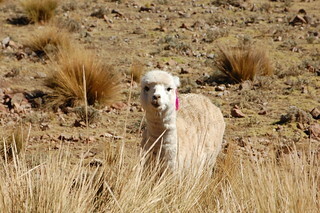 What is unique about Qampaq Arte is that they ask the artisans to produce for the international market, using luxurious alpaca wool rather than the more common acrylic blend, and adapting the local style to be more wearable outside of cultural events. I highly suggest stopping by their store, if only to admire the talent of their artisans. Next, I walked along the main commercial stretch of Av. Manchego Muñoz to the train station. 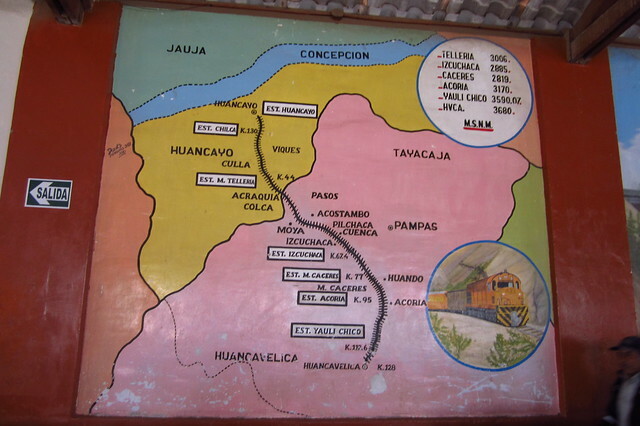 In addition to its artesanía and traditional dances, Huancavelica is known for the Tren Macho which runs between Huancayo and Huancavelica. 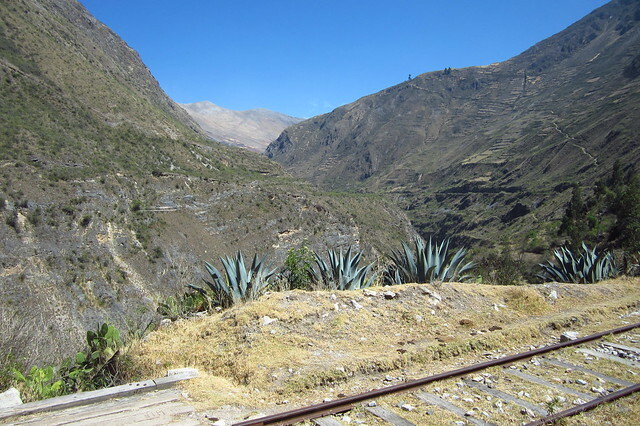 Unlike the train that runs between Cuzco and Agua Calientes, the Tren Macho is still an affordable passenger train and the safest, most interesting way to travel between the two cities. The train runs every other day, and I really wanted to ride it. I bought my ticket for the next day, leaving bright and early at 6:30AM. 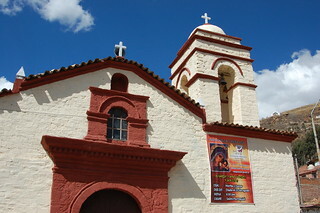 After the train station, I wandered over the Plaza Ramón Castilla to see the Iglesia Santa Ana, the first church constructed in Huancavelica. As you can see, this church has a lot in common with the church in Santa Barbara. This plaza is definitely where the locals hang out and enjoy the sunshine. 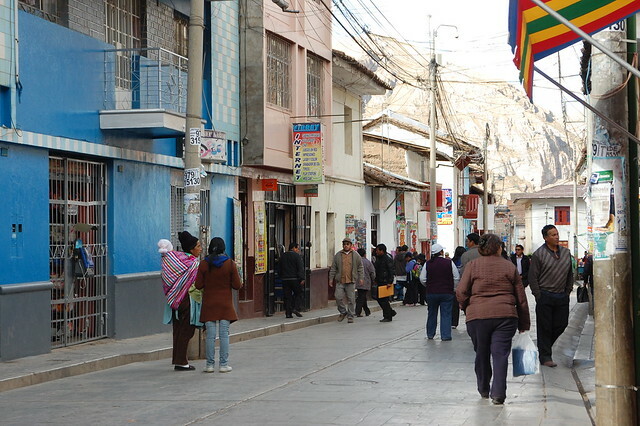 Located beneath the plaza is an underground market catering to locals with several stands selling traditional costumes for festivals as well as shawls and other clothing used by the women of Huancavelica on a daily basis. From Plaza Ramón Castilla, I continued on to Villa Cariño and Seccsechaca, located on the outskirts of the city. Villa Cariño hosts an outdoor park with more thermal baths. To get there, you follow the train tracks across the river and then walk along well-worn paths and staircases through boulders and large rocks. As I was wandering along the rocky paths, I looked out over the more residential part of town, with the modern, nondescript brick constructions common throughout Peru. Locals passed me on the paths, heading to and from the center of town. I enjoyed the walk, my relative solitude, and the gorgeous views. However, there were no signs marking the way, I couldn’t spot the thermal baths through the rocks, and eventually I felt a little uncomfortable climbing around on my own with my fancy camera. 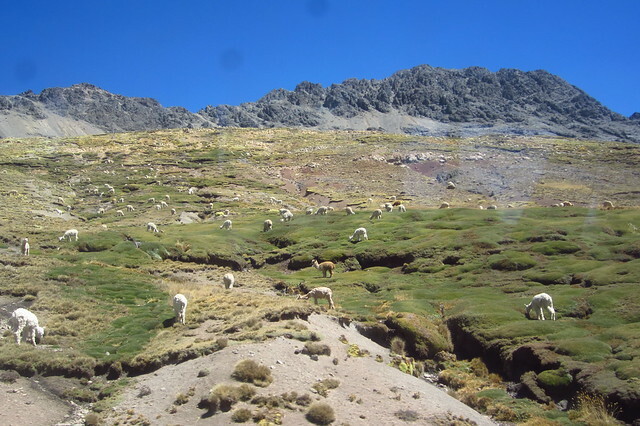 In the end, I never made it to Seccsachaca, where I could have visited the Baños del Inca and Tres Boas (which you can see at the end of this blog post). 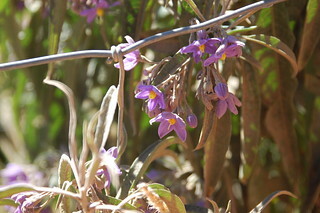 I retraced my steps along the train tracks that I would be traveling along the next morning and headed back into town. I decided to take another route back into town, following a different road which ran parallel to the river and the train tracks. This gave me more views of the residential part of town, whose buildings reminded me just a little bit of Huaycán. 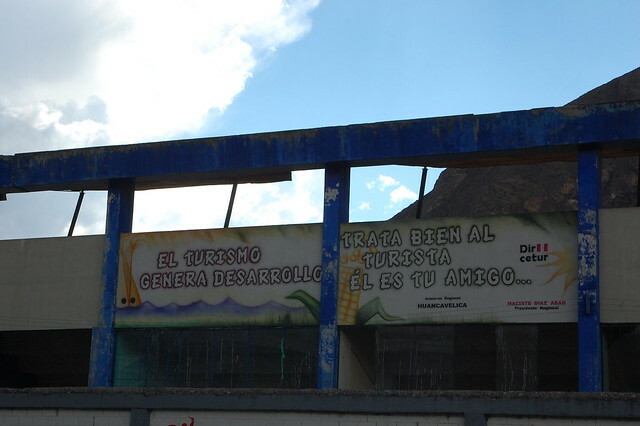 On the way, I spotted this mural painted by Dircetur, the regional tourism office, encouraging the people of Huancavelica to embrace tourism. 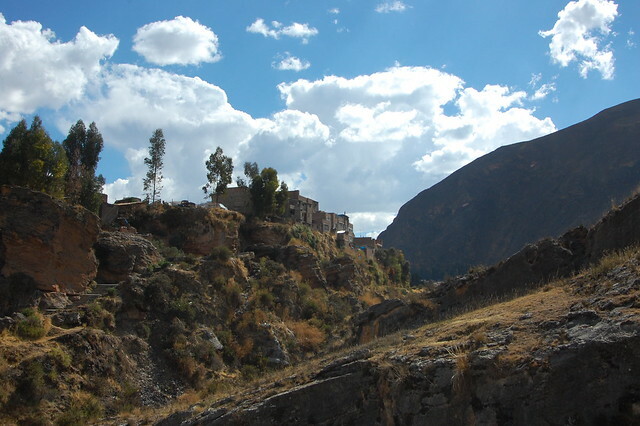 Huancavelica does not receive a lot of tourists and I found that the locals were generally disinterested in my presence, which I honestly didn’t mind too much. 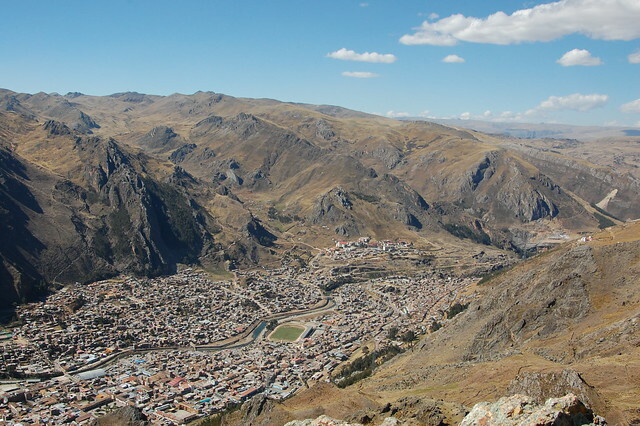 I think this is why some travelers are drawn to the small cities of central Peru; it feels a little more authentic to be ignored rather than courted. Back in the center of town, I took advantage of the last of the daylight hours to go shopping for the gorgeous artesanía I’d come there for. I’d read that the most talented artisans travel from their villages and sell their handknit gloves, hats, and scarves along Av. 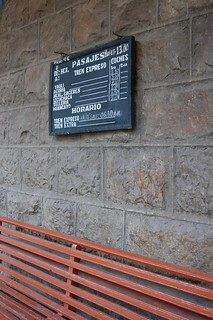 Manchego Muñoz, near the Plaza de Armas, under the blue Municipal building (Municipio). 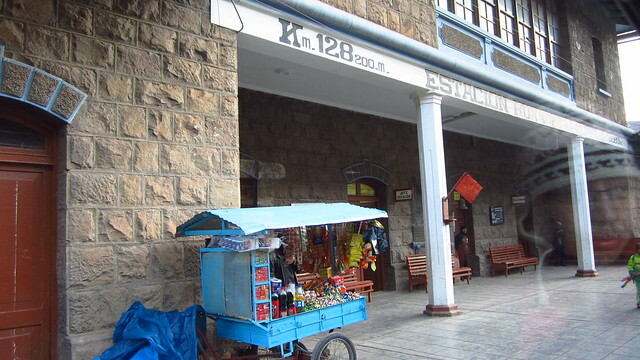 Just walk towards the train station from the Plaza de Armas and you’ll spot the stands selling machine knit, generic goods. The women from the surrounding villages, such as Yauli, sit on the ground on a tarp spread with their handknit masterpieces, selling at prices that are so low that it actually hurts my heart. Many of these women sell items knit from alpaca, thanks to the encouragement of fair trade organizations that have helped them trust in the quality of their art. I bought several pairs of gloves, leg warmers, and arm warmers knit in the colorful traditional style, like you see here. 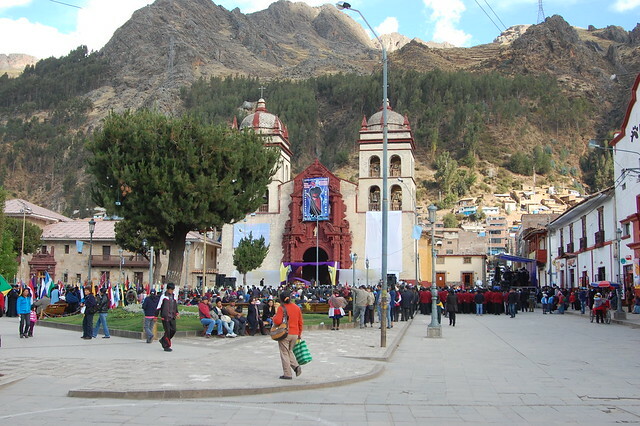 On this particular day, all of Huancavelica was out in the main plaza to celebrate the life of their Monseñor, who had recently passed away. 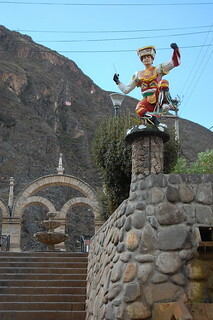 Like many Andean cities, Huancavelica is a deeply religious place and the entire town shut down with parades and musical performances honoring this man. By the end of my third day in Huancavelica, I felt like I had experienced the best of Huancavelica and was eager to continue on to Huancayo, just in time for my birthday. I left La Portada early in the morning to walk over to the train station for the 6:30 departure. At this altitude, carrying my heavy pack uphill was a challenge, so I gave myself extra time! I found my seat in the reserved buffet car, across from a friendly young medical student who attended university in Huancayo. She encouraged me to try the warm drink being sold by enterprising women wandering the aisles, a mixture of apple juice cooked with quinoa. Seriously delicious. The Tren Macho is a century old; it began service in 1926 and was modernized in 2008. It covers 128 kilometers, passing through 38 tunnels and over 15 bridges. The Tren Macho was supposedly named for its unreliable service in the past, which was likened to a stereotypical chauvinist man: as the saying goes, “parte cuando quiere y llega cuando puede,” or it leaves when it wants and arrives when it can. Today, there is a buffet car with reserved seating for S/.13, and open seating for S/.9. If you’re hungry, you can buy a full meal from the on-board restaurant, which looked amazing (but not vegetarian friendly at all). Otherwise, you can wait for the stops in the small towns along the way, where vendors get on board to sell their local delicacies. On a Thursday, there weren’t quite as many vendors as I had expected, but I did get bread and piña, or a slice of pineapple, a two of the stops. One of the things I liked best about my trip was that I had my backpacks in view the whole time, stored on the luggage rack above my head. I ended up spending most of the ride chatting with the medical student, as well as a young civil engineer who couldn’t resist his curiosity about this adventurous gringa in their midst and joined us. Knowing I was among friends, I snapped pictures of the rocky hillsides and greenery that passed by the window. I loved the relaxed ride, especially once we got into the sun and the chilly car began to warm up! 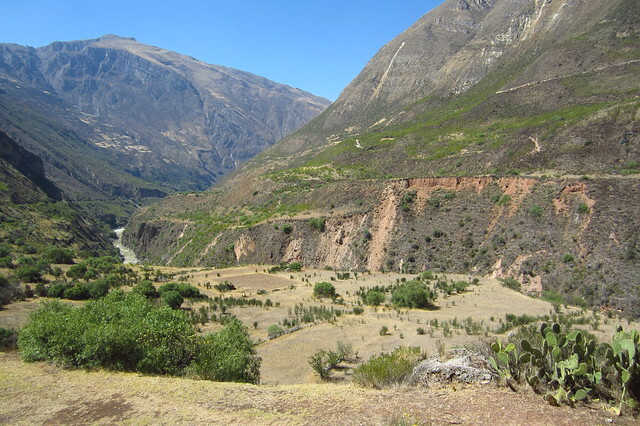 As we arrived into Huancayo, the scenery was definitely different, more agricultural, and more forested. 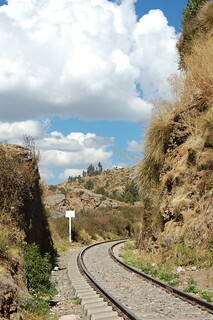 The train runs right through these fields, giving you a nice introduction to the natural beauty that surrounds Huancayo. 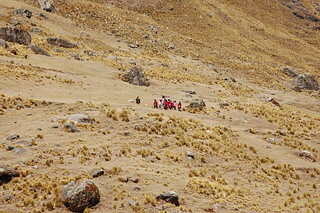 Riding the Tren Macho is definitely one of the most unique and authentic things you can do in this region, giving you a chance to see the countryside, eat local food, and meet friendly Peruvians. After we arrived, my new friends put me into a taxi to my hostel in Huancayo. 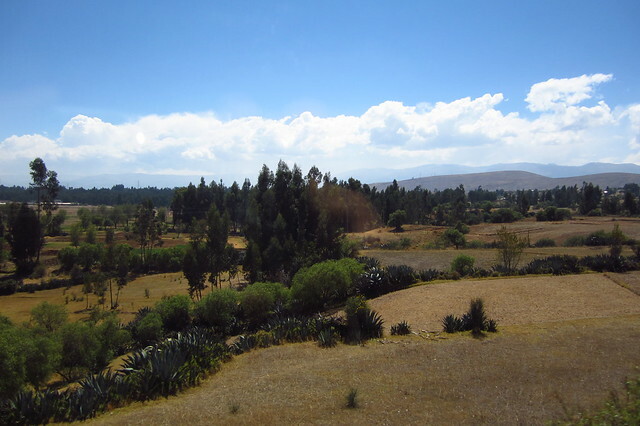 After such a beautiful train ride, I was ready to explore the city and countryside of Huancayo! 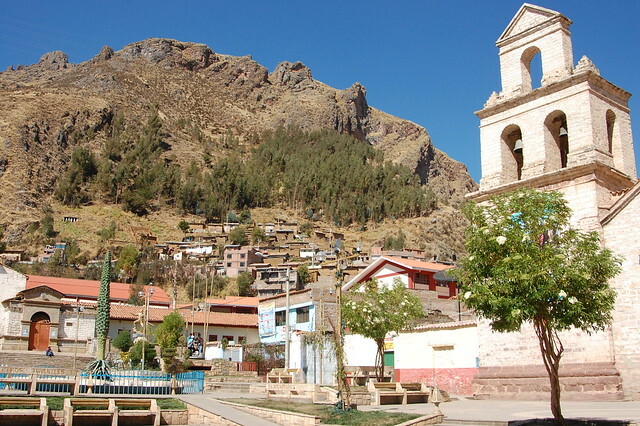 If you’re interested in learning more about the history and culture of Huancavelica, you should visit the Museo Regional Daniel Hernández Morillo, half a block from the Plaza de Armas at the Plazoleta de San Juan de Dios. 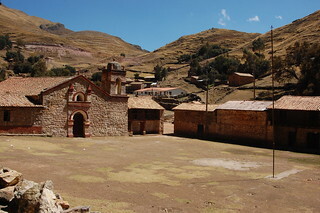 If you read Spanish, this Wikipedia article has a nice summary of Huancavelica’s history. You should definitely visit Seccsechaca at Villa Cariño. If you get a map from the tourist office, you can follow the marked route there by walking along Av. Manchego Muñoz and crossing over to Jr. O’Donovan (which runs parallel) once you reach the Iglesia Santa Ana. 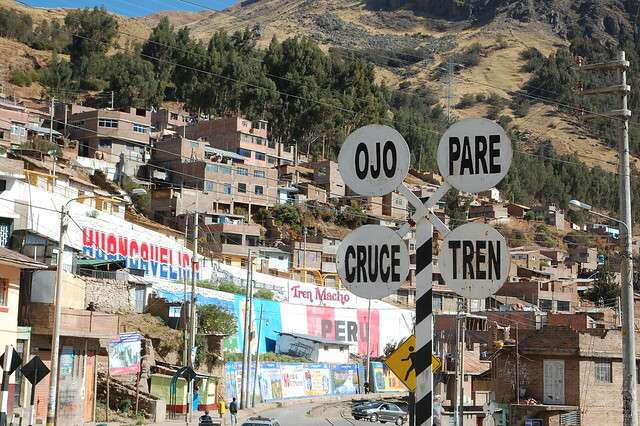 Follow this street to its end and then follow the train tracks to Villa Cariño. It is not well-marked but it is a footpath followed by locals so you can ask around for directions. 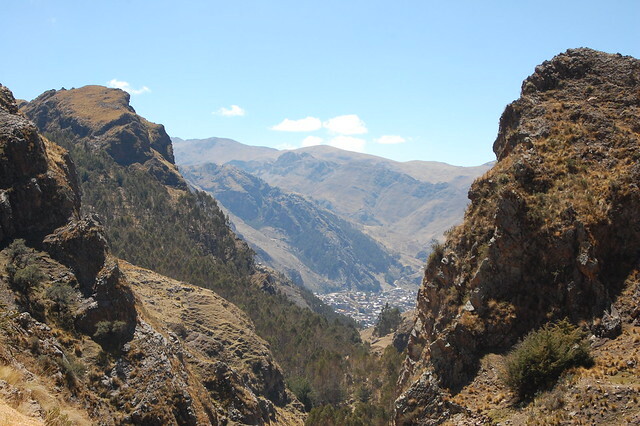 Seccsechaca hosts two thermal baths, the Baños del Inca and Tres Boas (which you can see at the end of this blog post). If you’d rather stick to the thermal baths in town, visit the Piscina de San Cristóbal by following the river until you find the wide staircase lined with artwork celebrating Huancavelica’s cultural heritage. Even if you aren’t interested in the thermal baths, the artwork along the way is absolutely worth seeing. 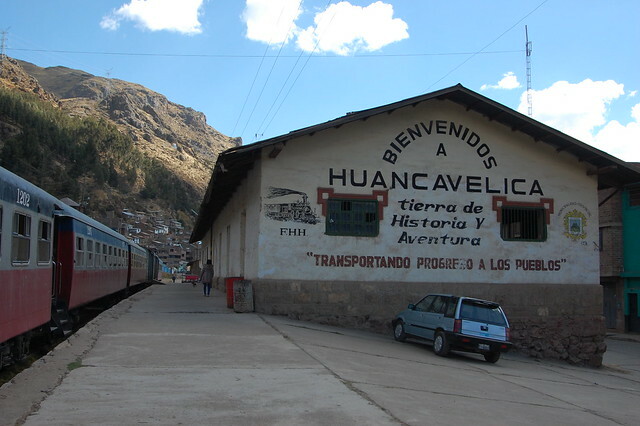 If you visit Huancavelica, you have to take the Tren Macho to or from Huancayo. The full route costs S/.9 or S/.13 if you want an assigned seat in the buffet car. You can buy food on board, either from the train’s own restaurant or from the local vendors who sometimes get on at each stop along the route. 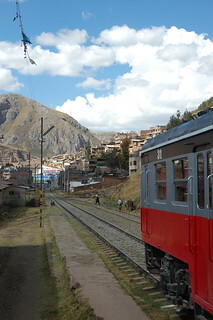 If for some reason you can’t take the train yourself, please check out these amazing photos which capture the spirit of the ride by Oscar Durand, a talented Peruvian photographer/photojournalist. 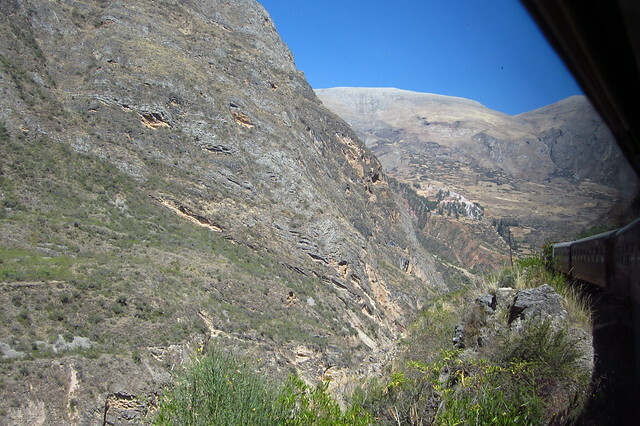 This blog post also has some great photos and videos of the trip on the Tren Macho as well as the artisans and artesanía around Huancavelica. 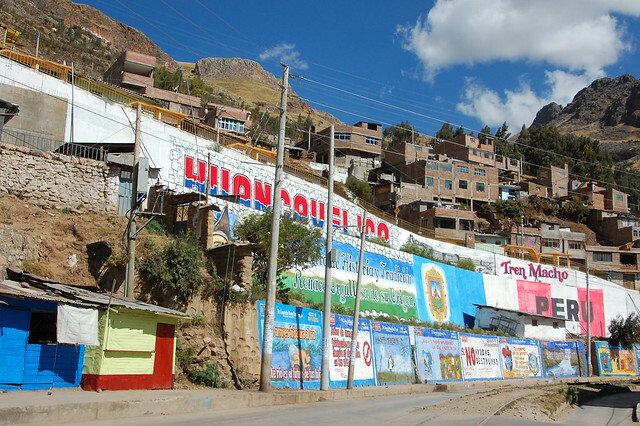 The Wikitravel guide for Huancavelica has some great suggestions, including how to get to the Incan ruins at Uchkus-Incañan and the Sunday market in Yauli. My interest in Huancavelica had been piqued at an artisan market I visited in Miraflores in July 2012. While there are several commercial markets in clusters around Lima filled with mass produced wool and alpaca goods at low prices, Miraflores hosts the occasional artisan market in Parque Kennedy. One such market, De Nuestras Manos (From Our Hands), invited the most talented artisan collectives from around Peru. I wandered around for hours, familiarizing myself with the knitted goods, weavings, embroidery, silver jewelry, and other handiwork specific to the various regions of Peru. I fell in love with Ayacucho’s brightly colored flower embroidery as well as the geometric patterned shawls and multicolored gloves from Huancavelica (which you can see here and here). I knew I had to go direct to the source of this artwork and see if I could learn a thing or two about their craft. 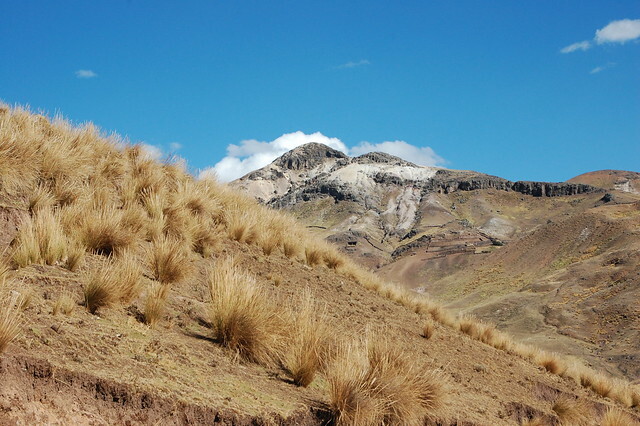 In terms of physical location, Huancavelica is relatively close to Ayacucho, but in reality, it is a bit challenging to get there. One reason is that this area still sees the occasionally robbery on night buses and certain highways are to be avoided outside of daylight hours. 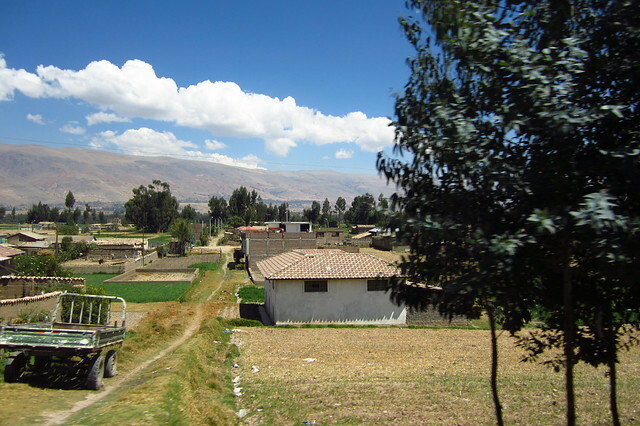 After consulting with my friends at iPeru, I decided that the safest and most direct option was to take a combi from Huamanga to Rumichaca and then catch the daily bus from Rumichaca to Huancavelica. Rumichaca is nothing more than a truck stop located along the main highway between Ayacucho and Lima, filled with food stands and basic hostales. 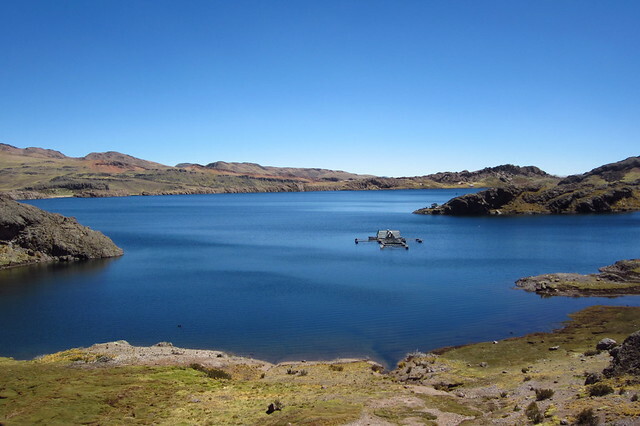 Combi buses leave from Huamanga at 4:30 and 5:30AM for Rumichaca and take about three hours. I bought my ticket the day before, which got me a more comfortable seat up front with the driver, where I could admire the views out of the front window. I will never forget the colors of the amazing sunrise over the hills of Ayacucho as our bus climbed out of Huamanga. Unfortunately, as the only foreigner on the bus, I was a little shy at first about taking out my camera to capture the gorgeous scenery so all I have are my memories. 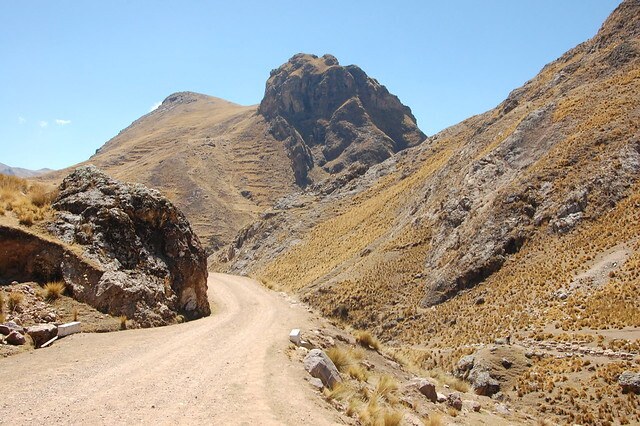 Leaving Ayacucho, the bus climbs slowly but steadily towards Abra Apacheta, the highest pass on our route, located at 4,746 meters above sea level. The high altitude meant that I dozed in and out of sleep, opening my eyes long enough to catch the gorgeous colors of the hillside. At Abra Apacheta, our driver stopped for a moment to lay an offering of a bouquet of fresh flowers at a small altar at this high pass. I still wonder whether he had lost a colleague in an accident here or if it was simply a gesture of gratitude for safe travels on these dangerous, winding roads. 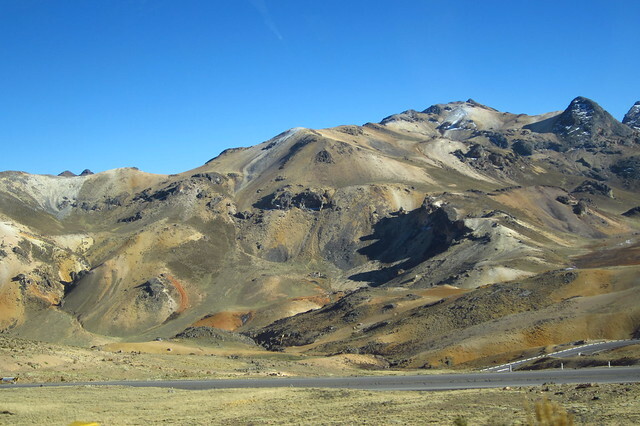 The above photo captures some of the multicolored hills soon after this high pass. After about three hours, we arrived in Rumichaca. I bought my ticket to Huancavelica and stored my big backpack under the bus, then turned my attention to breakfast. I opted for papas con queso, small local boiled potatoes served with the queso fresco, or farmer’s cheese, common throughout Peru. After, it was a quiet wait in the sun for our bus to leave at 10AM. 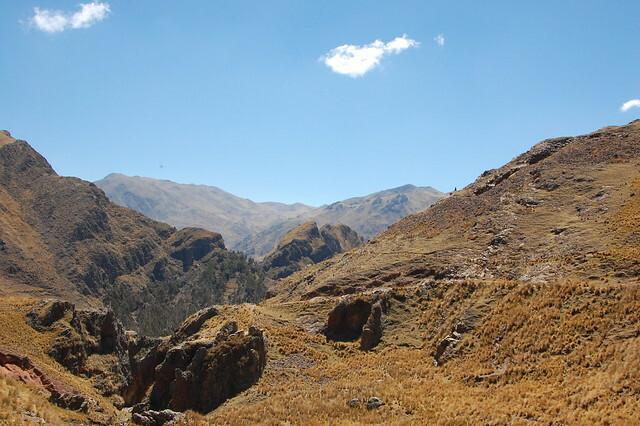 The Huancavelica region is a generally tranquil stretch of farmlands in the high Andes. With so many idyllic landscapes, it is considered a great place to relax and recharge. 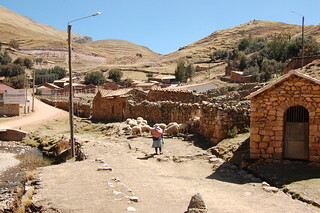 Since combis and buses are so regular, if not frequent, around the area, it is possible to visit many of the small villages that dot the landscape. 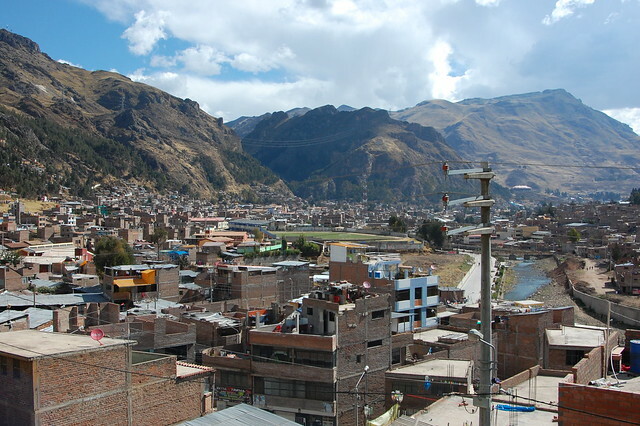 After a long trip with a lot of stops to pick up and drop off passengers, we arrived in Huancavelica. 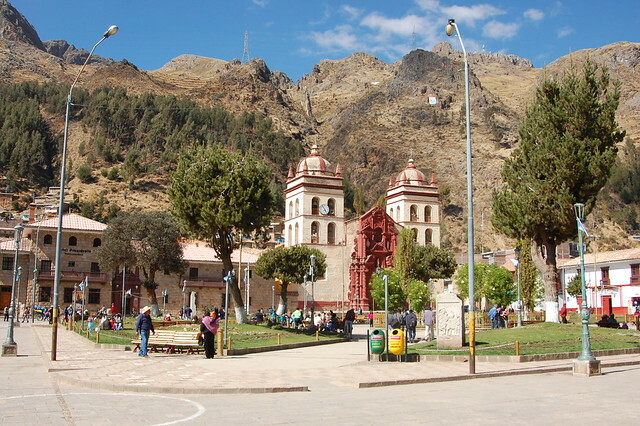 Huancavelica is a compact city, but the buses leave you relatively far from the Plaza de Armas. The kind gentleman seated beside me took it upon himself to put me into one of the taxi colectivos that travel through the city and commanded the driver to drop me off in front of my hostal, La Portada. 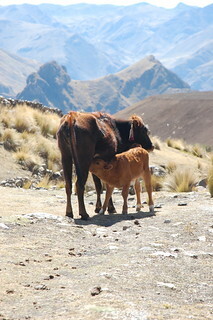 This was just another example of Peruvian kindness. After splurging for a nice room with a private bathroom, tv, and free wifi, I set out on foot to take advantage of the afternoon sun and to get a feel for the city. 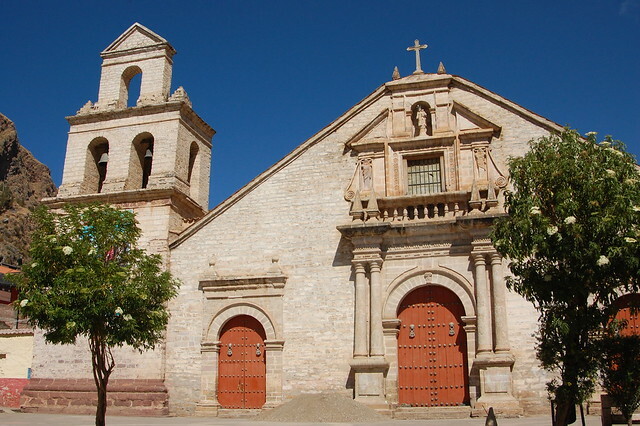 After wandering around the Plaza de Armas, I walked a few blocks over to the Plaza Bolognesi, where two of Huancavelica’s distinctive churches are located. I stopped in a small cafe situated on the plaza to have a snack before continuing my wanderings around Huancavelica’s small downtown area. Of course, I couldn’t resist checking out the artisan stands located in a small alleyway near the main plaza. I ended up chatting for quite a while with an older couple selling the regional knitted goods. I also managed to find my way to Dircetur, the regional tourism office, where they walked me through all of my options around the area. 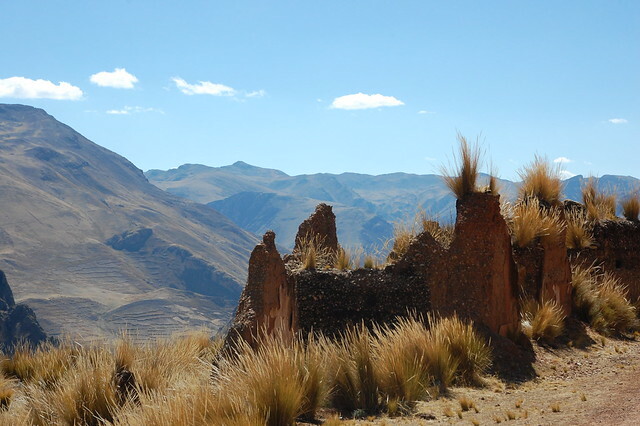 While there are interesting Incan ruins around the region, there are not many tour operators and it is challenging to visit them independently. In the end, I decided to visit the most important tourist attraction in Huancavelica, the Santa Barbara mines, by hiking up independently. I set out for Mina Santa Barbara early in the morning, knowing that the sun in the high Andes would only get stronger as the day went on. There is a well-marked path from Plaza Bolognesi which follows the river until you reach the stone walkway that leads up towards Sacsamarca, the small village located en route to Santa Barbara. 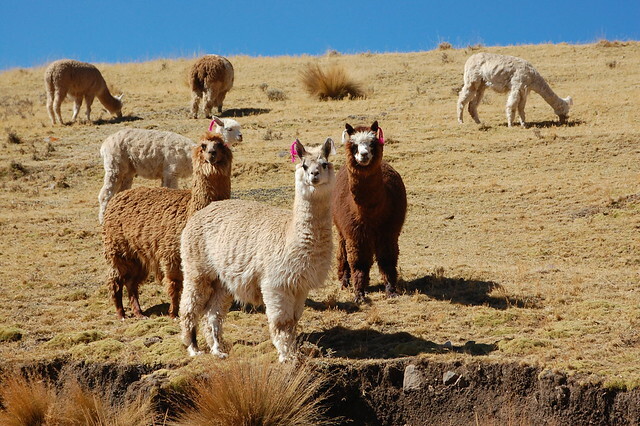 I climbed steadily and was accompanied for much of the way by an elderly gentleman who owned some of these llamas grazing amongst the trees and grasses that lined the path. 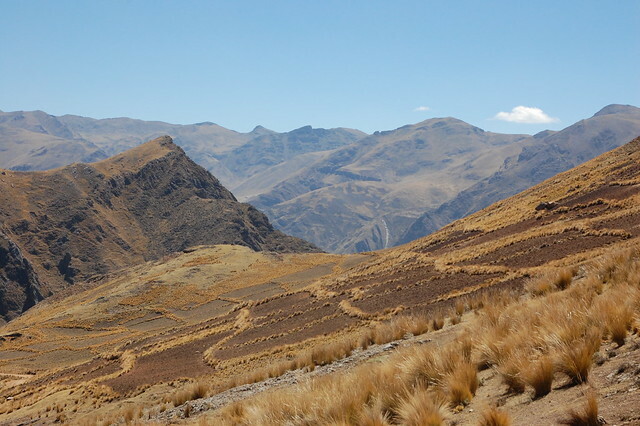 However, he was much more capable (read: faster) than me at this high altitude and eventually I had to stop and rest and breathe, taking in the pretty scenery as I admired the views of Huancavelica from above. Finally, I made it to the small village of Sacsamarca, a quiet collection of houses and stone buildings that looked like they might date back to the colonial era. After spending the previous day wandering the busy streets of Huancavelica, it was refreshing to walk along these empty roads. 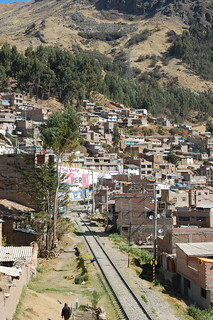 Apparently, this small town has a strong sense of community and hosts traditional fiestas popular with Peruvian tourists. 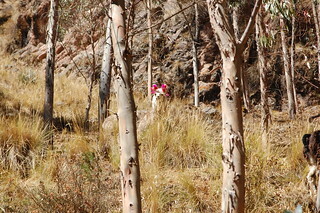 Its unique setting among the rocky hills of Huancavelica must make for a picturesque setting as well as a natural amphitheater. 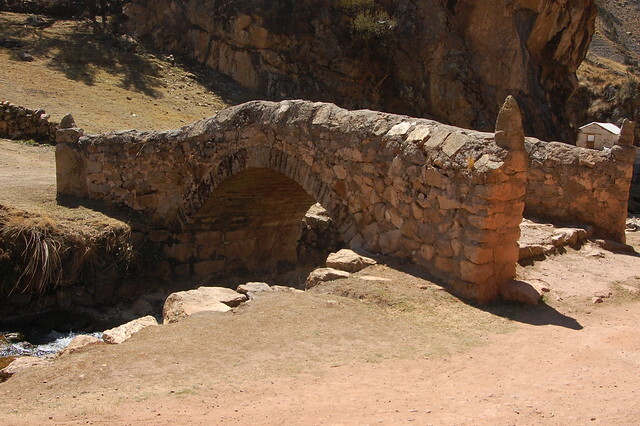 This stone bridge dates back to colonial times and is one of the main attractions of the town, providing an easy way to cross the small stream that criss-crosses Sacsamarca. I felt instantly welcomed to Sacsamarca by this local woman herding her sheep, who greeted me warmly as she continued along her way. On the outskirts of town, there is a trout farm. 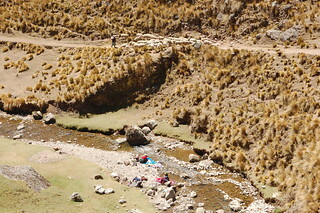 I walked most of the way there, just to get another perspective on the area around Sacsamarca, watching women doing their washing in the river and children playing outside with their teacher. After exploring Sacsamarca, it was time continue my walk uphill to Santa Barbara. Even though it’s cold at night in Huancavelica, the sun is very strong at this altitude. Revisiting these photos, I can almost feel the sun beating down on me! 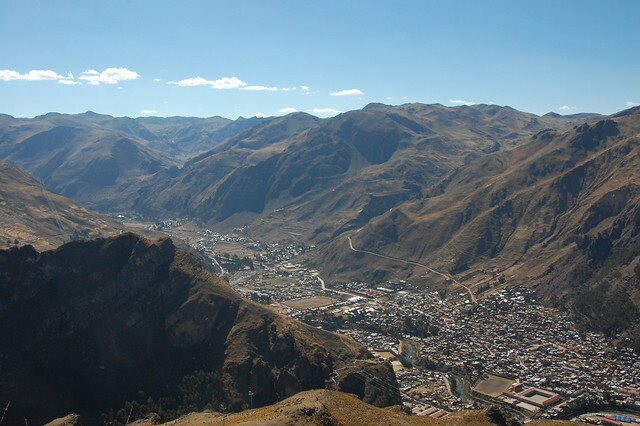 Along the way, I got a great view of Huancavelica from above, peeking through the craggy rocks that surround the city. Unsure of the best route to Santa Barbara, I decided to follow the vehicle road. Luckily for me, it was signposted so I had a clear sense of how much progress I was making on the steep 2km climb. 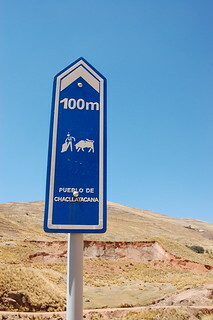 En route to Santa Barbara, I passed through Chacllatacana, an even smaller village known for its bullfights. 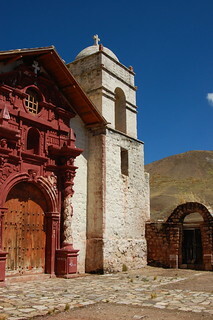 The town consists of a small church and several brick buildings built around a large open plaza. I knew I was getting close when I heard voices calling out to me. A few miners on their lunch break were trying to signal to me that my friends (other foreigners) were up ahead and had taken a shortcut to the top. Because of the wide, flat expanse, I could hear them clearly even though they were off in the distance. I took their advice and tried the even steeper, direct route through the high desert brush, but ultimately opted to continue my slow but steady journey along the main road. As I approached Santa Barbara, I passed the entrance to the modern mine, where I spoke with the friendly driver of the shuttle bus that brings the miners to and from work each day. 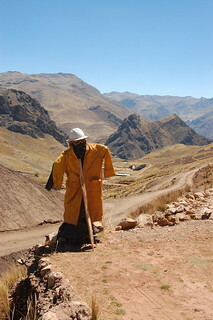 He waits around all day for the miners to finish their work and was eager for a distraction. 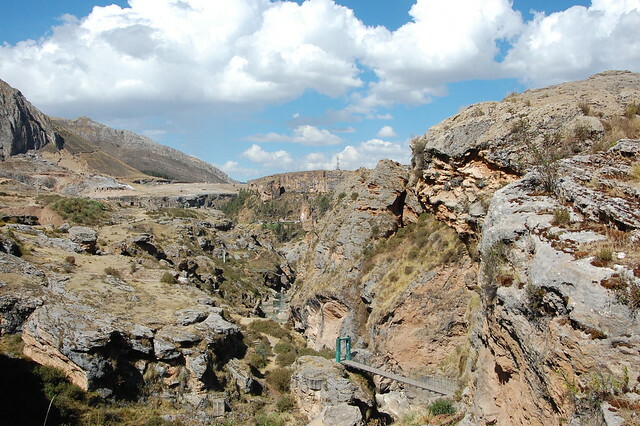 He suggested that I take the detour to the viewpoint that overlooks Huancavelica and head back to Huancavelica from there. Otherwise, he promised that he would be happy to drive me down when the miners finished their work for the day so that I would not be harassed by the teenagers who lurk around the stone path after school. After saying goodbye, I continued along my way and finally arrived at the old mine of Santa Barbara, which still bears the Spanish crown over its entrance. 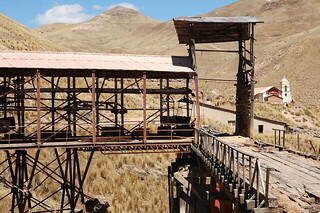 For safety reasons, the mine is off limits to visitors, and it is impossible to see much inside through the gates. I read some reports that there was a full city constructed underground. Standing at the entrance, I couldn’t help but be moved by the thought of how many lives had been lost working in this mine since colonial times. 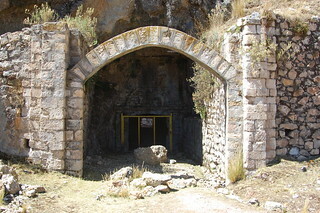 This mine is known as the “Mina de la Muerte,” or the mine of death, for the deadly work of extracting mercury. 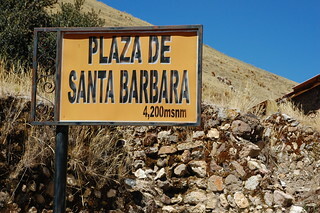 A few meters beyond the colonial mine lies the abandoned town of Santa Barbara, located at 4,200 meters above sea level. 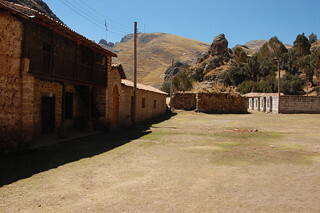 The small central plaza is surrounded by crumbling stone buildings, and the whole effect is eerie. Scraggly dogs wandered around the plaza, but the only sound you can hear is the machinery of the modern mine, nearby. 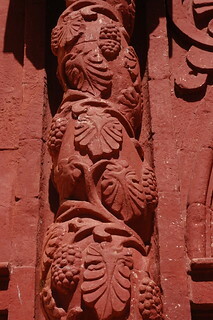 While many of the buildings are in ruins, the church retains some of its former elegance. 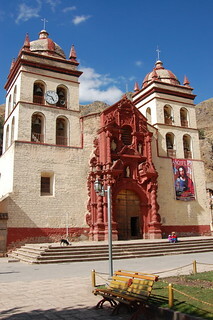 Its distinctive red and white style echoes the churches located in Huancavelica. Here, I ran into the other foreigners that the miners had thought were my friends. The four French travelers had stopped to have a picnic lunch; I was relieved to find out I was not the only gringo in town. We ended up making plans to have dinner together that night, and then we continued our separate explorations. After sufficiently exploring the area around Santa Barbara, I retraced my steps and headed to the viewpoint overlooking Huancavelica. Along the way, I passed a herd of llama grazing in the grasses of the area around Santa Barbara. Some of them stared right at me, suspiciously, as I stopped to take their picture. I couldn’t get enough of these adorable creatures. 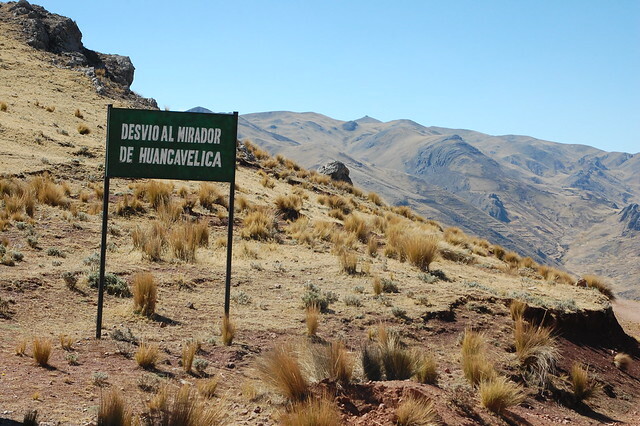 The pathway to the viewpoint overlooking Huancavelica is well-marked; the detour to the mirador is well worth it. 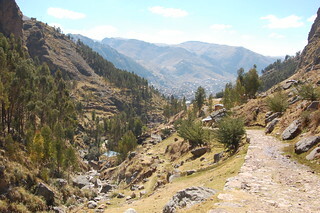 After climbing over and around the boulders around the mirador, I arrived to the spot with the best views in the area. 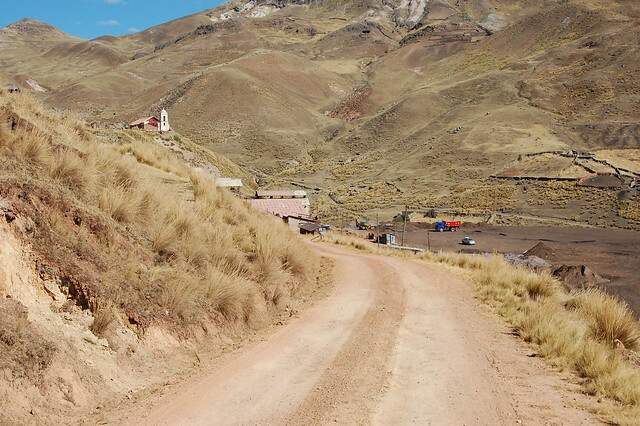 You can’t help but feel an affinity for this picturesque town nestled within the rolling hills of the high Andes. I looked around and identified the main plaza and other recognizable buildings from above. Even though the city felt relatively small when I was wandering through its streets, I realized just how big it was when observing it from this altitude! After enjoying a quiet moment looking out over Huancavelica, I decided to head back to Santa Barbara to hitch a ride with the miners. After so much time walking under the bright sun, I was tired and figured I would take advantage of the generous (and convenient) offer. I really enjoyed my solitude for the majority of the day; I felt very relaxed and centered after walking through these golden brown hills. It reminded me of my long walks around Easter Island, only occasionally running into other people. As it turns out, riding with the miners was a great way to end my afternoon. They were so friendly and intrigued by this foreign woman hitching a ride with them. The ride took all of ten minutes, and this gave me some extra time to wander around the commercial streets of Huancavelica, buying delicious street food like churros, choclo con queso, and local bread. Afterwards, I went out for pizza at Roma II with my new French friends and enjoyed some hot wine. Even though I had roasted under the sun all day, the nights were cold and I couldn’t resist a warm drink! 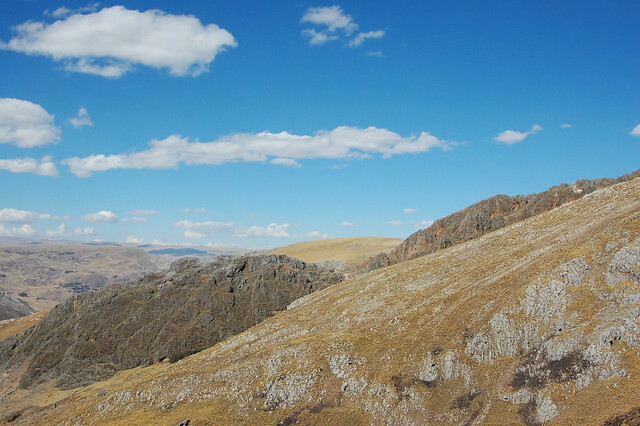 After spending the day observing Huancavelica from above, I was curious to expand my wanderings and explore some of its other attractions on foot the next day. 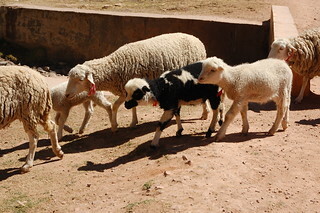 I also was ready to shop for the knitted gloves and woven shawls that had brought me to Huancavelica in the first place! 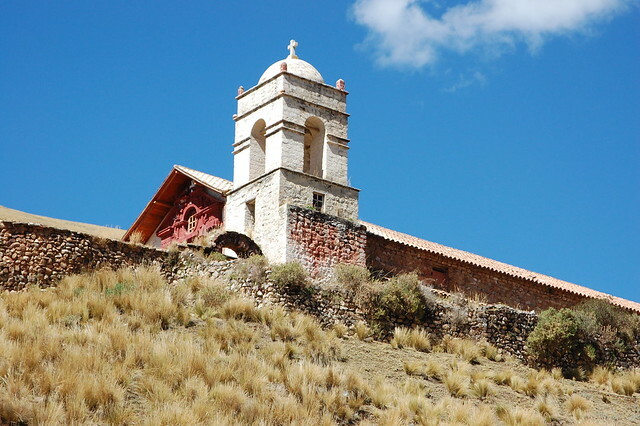 Wikitravel has a lot of good recommendations for things to do and places to eat, shop, and stay around Huancavelica. I highly suggest trekking up to Santa Barbara, especially if you are trying to build your stamina for other high altitude hikes in the central highlands. Get a map from Dircetur or the municipal tourist agency located on the Plaza de Armas. 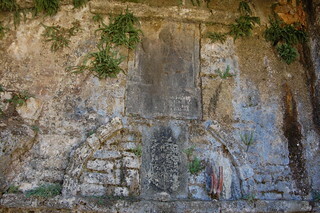 The route to Sacsamarca/Santa Barbara begins behind the Plaza Bolognesi and is well-marked. Once I reached Sacsamarca, I found it easiest to follow the main vehicle road to Santa Barbara, but there are also local footpaths that are probably shorter if you’re more daring than me. Make sure you take a look around Sacsamarca to get a sense of the traditional stone village. 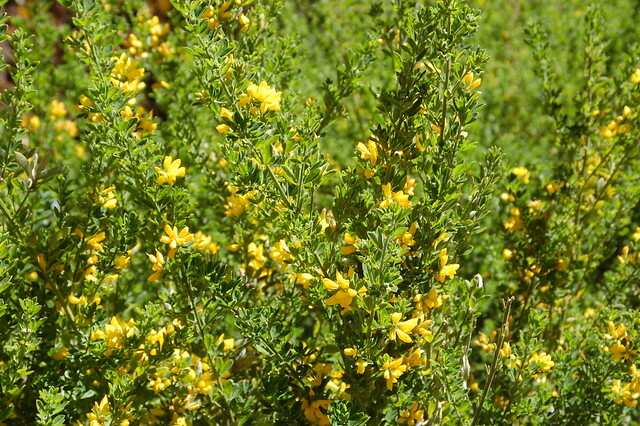 If you read Spanish, this blog post provides some good information on Sacsamarca. Stay at La Portada, located just a few blocks from the Plaza de Armas at Virrey Toledo 252. In August 2013, I paid S/.35 per night for a room with a private bath with consistently hot water and cable television. 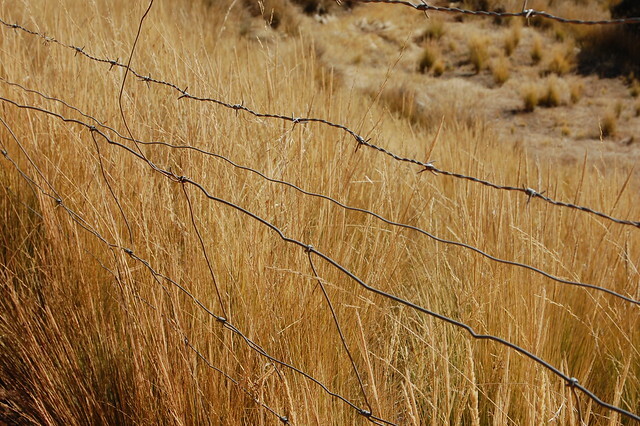 Their wi-fi connection is strong and they offer plenty of blankets to get you through the cold Andean nights. 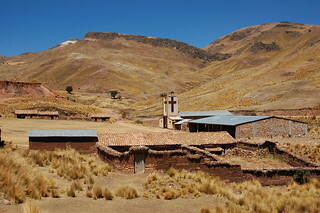 This blog post has some great photos of Huancavelica, as does this one. 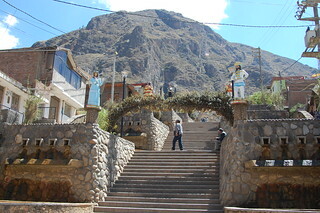 This is a lovely tribute to the people of the small communities of the Huancavelica region. The months continue to fly by. I joke that it has been winter for four months, because I arrived back to the U.S. four months ago and winter basically began the next day. That said, spring is just around the corner. I have been saying this for the better part of the last six weeks, but this time, I mean it. Spring is finally coming, and with it, all the rebirth and renewal that we are waiting for. In my last entry, I mentioned that I was suffering from reverse culture shock, a typical experience for anyone who spends a lengthy amount of time overseas and returns “home.” Sometime in February, the storm clouds over my head broke, just as in the above photo. I took this picture during a hike on my birthday; we’d hiked to our destination and planned to have a picnic, when suddenly a downpour made us run and take cover. 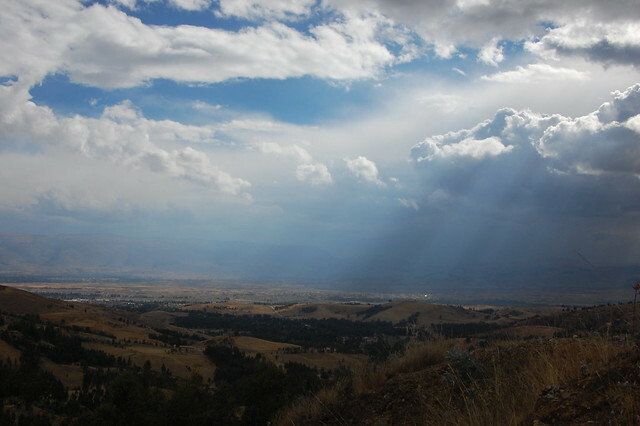 After a short time, the clouds blew away and the sun came out, leading to a beautiful view over the landscape. Obviously, it was totally worth it. The final stage of reverse culture shock is acceptance, and I appear to have arrived at that stage, mainly by keeping myself busy and trying to concentrate on the lessons I learned from my year volunteering and my time traveling. I am not sure exactly where my life is going to take me next, but I’m determined to enjoy the journey. In the meantime, I’m working and playing hard. In addition to my intensive ESL class, I’ve picked up a private lesson and an oral communication class; I’m working towards my TESOL certificate in an accelerated fashion so that I will be done by June. I’ve committed to my yoga practice, and, in a happy turn of events, I’ve found an ever-expanding circle of ladies who are dedicated to salsa dancing every weekend. While traveling, I realized that all I need in any city is salsa dancing and yoga, so this has really helped my accept my life back in Cambridge for as long as I am here. As for the lessons I’ve learned, it is all about appreciating the present moment and trying not to hold on too tightly to the past. It means integrating who I was with who I am now, honoring the ways in which I have changed, and keeping myself from falling into bad habits or feeling lost. I am not lost. I am in transition, and this transition means I get to choose what I want to do going forward. Right now, I am choosing to remain open to the possibilities and not making any rash decisions. I still want to use this blog to share photos of my travels and experiences and tips on how to get to some of the harder-to-reach locations, but I am over six months behind in reviewing my photos! I am hoping my next quarter of classes will be less intense so that I can redirect some of my energy to writing. There are so many stories I want to share.